We never liked that stuff. 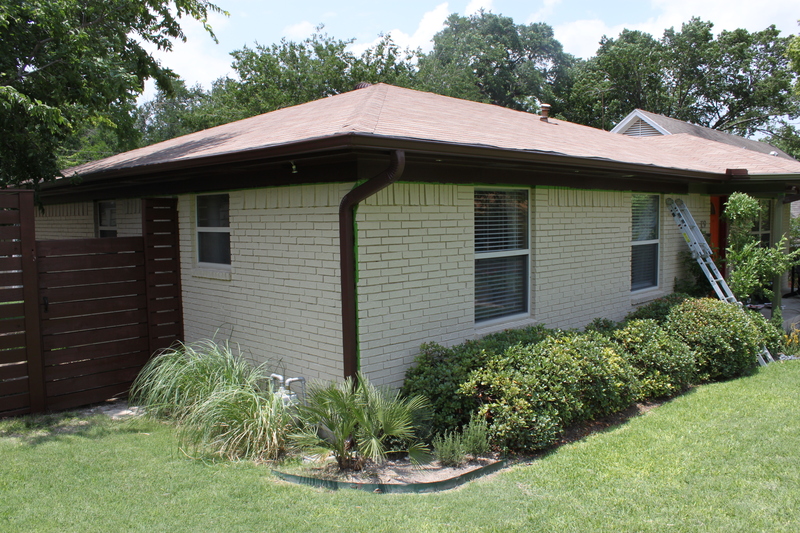 Here’s a picture for the front corner of the house about 2 (has it really been that long) years ago when we painted the eaves chocolate-brown. The Pampas grass we planted so I wouldn’t have to look at the gas meter, and the fan palm and rosemary are all huge now. The Hawthorn? It hasn’t changed since this picture. Jamie clipped down the branches as far as he could. 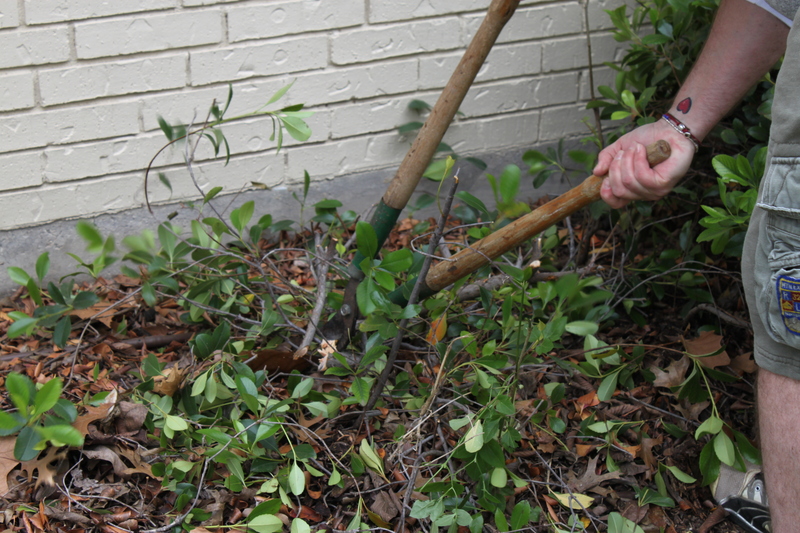 …then we painstakingly pulled the root balls out with our hands …..and occasionally a pick axe. Took most of the day to get to this point. Just one side of the front yard. 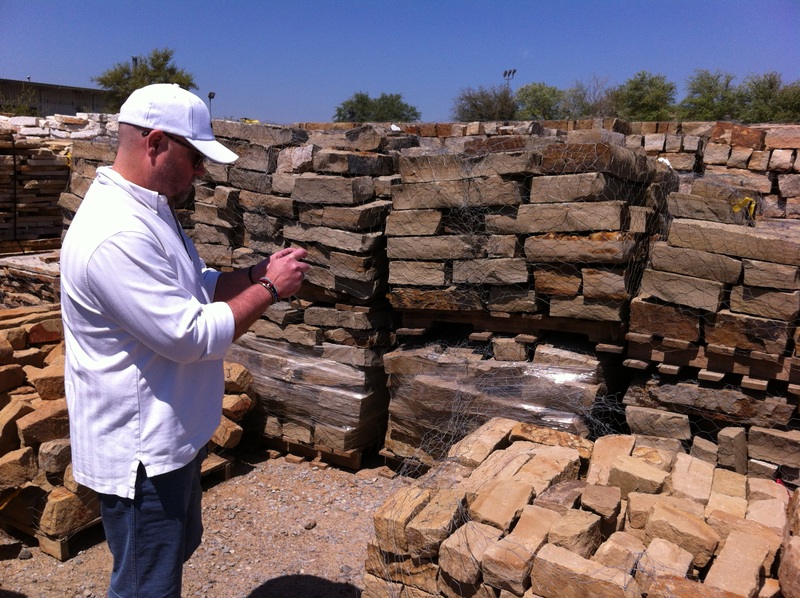 We were exhausted….but still had energy to shop for some stone. Custom Stone has been my favorite place to buy rocks for about 20 years now. They have everything. And their prices can’t be beat. All we knew was that we wanted a sandy colored wall to hold all the vegetation in…. 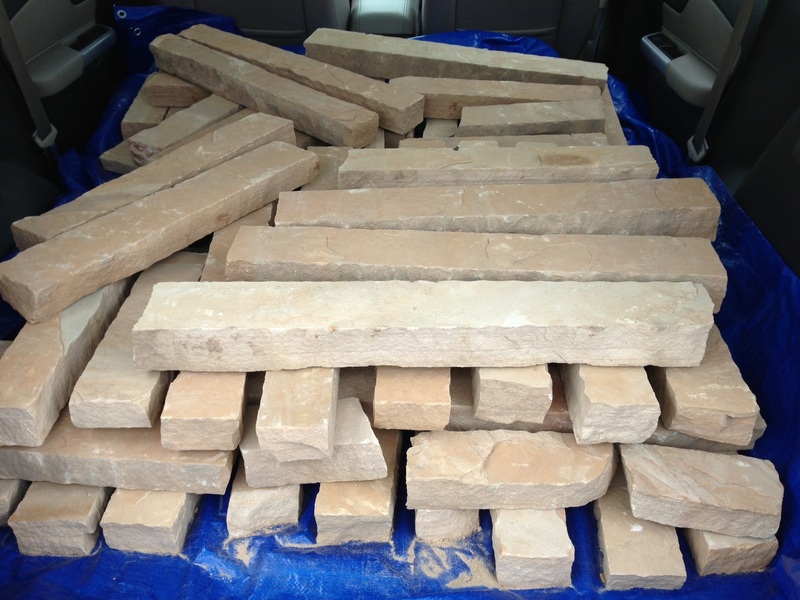 Custom Stone has a delivery service, but there is a 4 ton minimum. 4 tons seems like a LOT of rocks. A lot more than we would need. Since they charge by the ton, they simply weigh your vehicle before and after loading the stones. Then charge for the difference in weight. B T W , We got 1/5 of a ton. 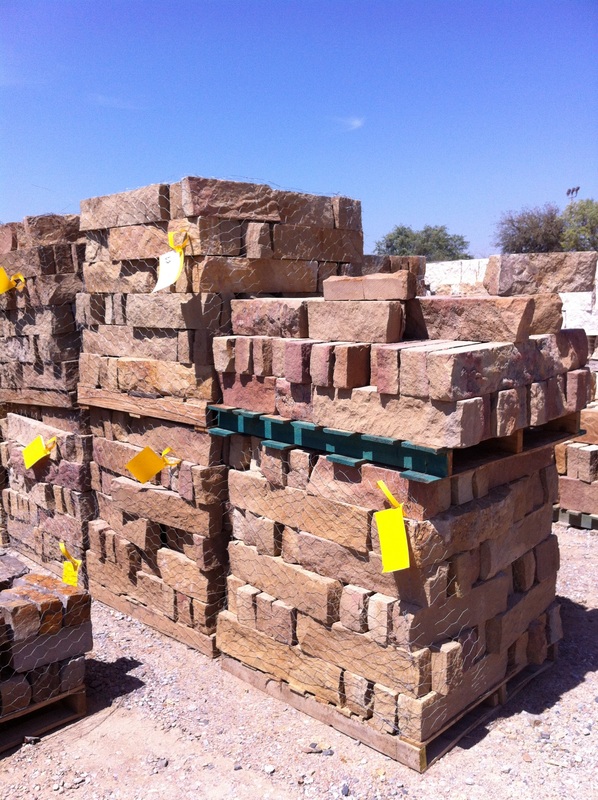 Of Arizona Buckskin Ledgestone, in case you were wondering. 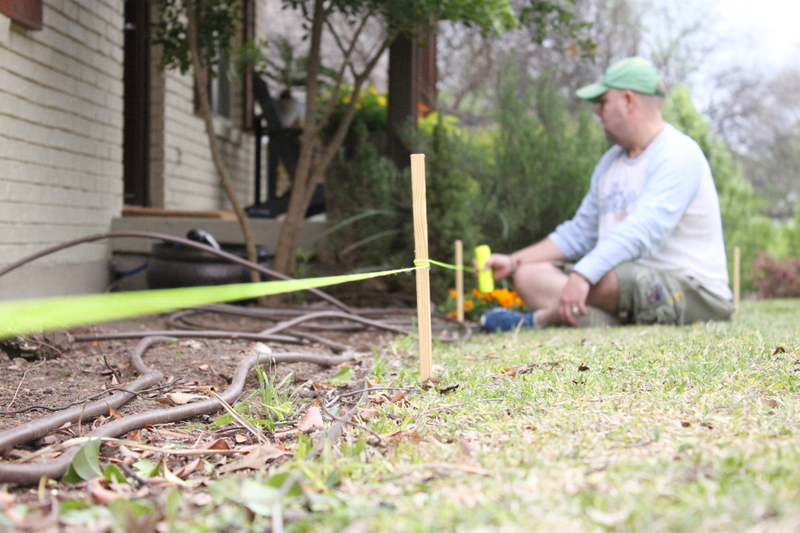 Then back home to lay out the perimeters of our wall with stakes and string…….oooh and a level. Jamie started by dry fitting all the rocks. Then he went back and glued them together with liquid nails. Yes, I am having a small amount of panic about filling in that much space with plants. I know , I know…they get bigger after you plant them. It just looks so “naked” right now. Mostly, I miss my Christmas lights. So nice!…and I actually didn’t know you could just use liquid nails to adhere! Smart! Oh…and I LOVE the Christmas decorations! I never saw that post…so beautiful! Love the door! Gonna be AWESOME! I have not one doubt!!! Lots of hard work to get this far. Proud of you two! Love the rock. What are those vent looking rectangular things underneath the windows? Looking forward to see the final result. 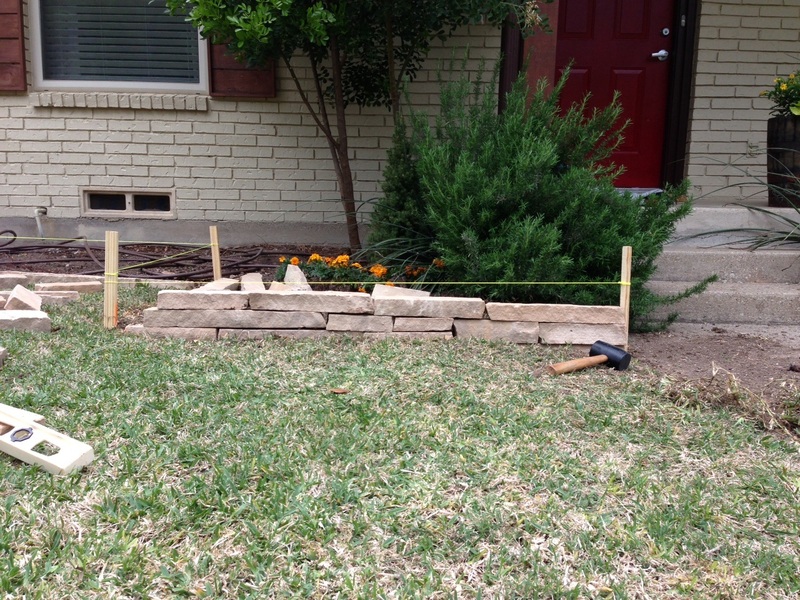 Am doing landscaping here too, but need some walkways poured or flagstone installed first. Good luck and thanks for posting this. Love your blog and both of your incredible styles and talents!! I am very interested in knowing if your rosemary survives transplanting! Every one I’ve ever moved has met it’s demise…I sure would love to know how to transplant one without killing it! Hi Randi, glad that your following along with us. And yes, sadly every rosemary we’ve ever transplanted had died too. You can grow rosemary from cuttings. LOL @ here’s a link so you can miss them, too. It’s good to laff again! 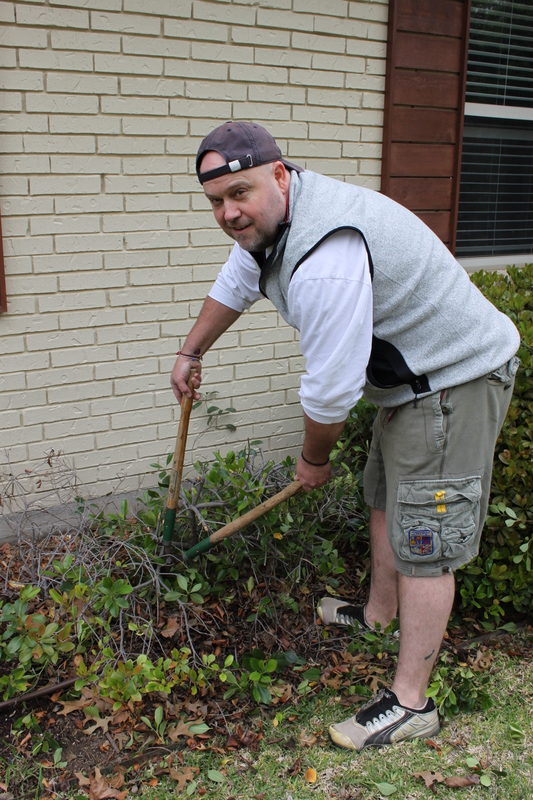 Are you planning to amend your soil before planting? I wish we’d done said-same to the foundation here. Don’t be worried about the open space! A few years ago my mother decided to rip out the bushes in front of her and my dad’s house and it left a huge space to fill. It has taken some, but her front lawn in so beautiful now. 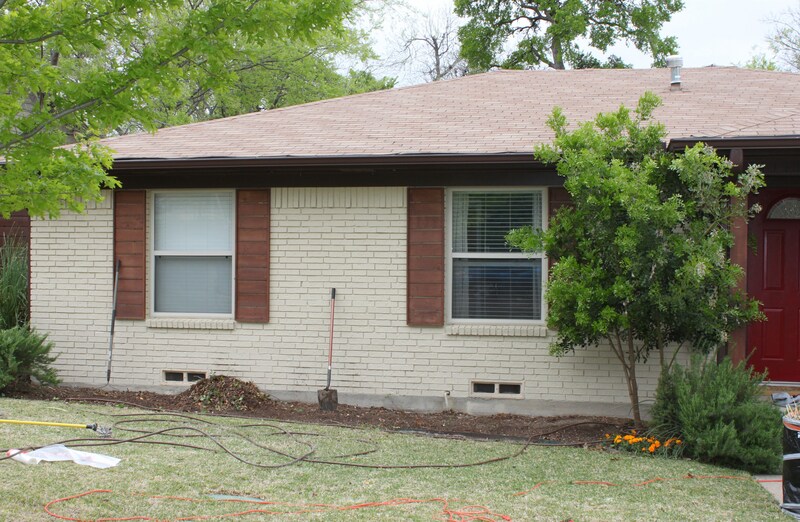 Not to mention those bricks are the PERFECT way to edge the flower bed. Good luck and please post pictures once it starts filling in! 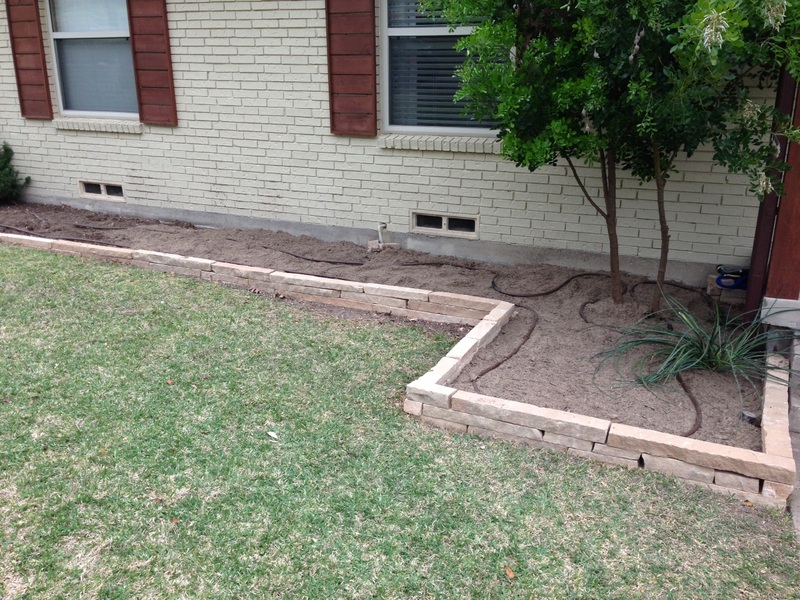 Thanks Kaci, we have been planting off and on for the past few weeks…….just added some cactus “cuttings” this evening. I’ll be sure to keep everyone posted on the progress.